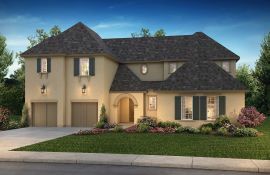 Just appoximately 25 minutes south of downtown Houston Texas, in the charming Pearland area, discover Meridiana in Iowa Colony, an innovative, upscale new home community that celebrates life as an ongoing opportunity for discovery. The Shea Homes collections within Meridiana are a short stroll from the pools, fitness center, café, and amphitheater of Amenity Village, and are just across the street from Meridiana Elementary School in the Alvin Independent School District. Major employers like Texas Medical, DOW Chemical, and BASF are close by to Iowa Colony and accessible by metro shuttle, which runs right from the neighborhood. In Iowa Colony at Meridiana, Shea Homes offers elegant one- and two-story new homes with grand, open floorplans ranging from ~3,073 to ~4,697 square feet. Fabulous outdoor living spaces can be customized with open-air kitchens, inviting fireplaces, and sliding glass doors.